I got their CBD oil and vape to help with fibro pain and my back pain and I haven't been this out of pain in years. It tastes and smells like the flavor that you get and it's easy on the lungs. I can't thank organically yours enough for such a wonderful experience. 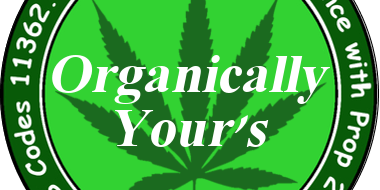 Posted on 04.07.19 Tonya C.
Posted on 08.17.18 Kevin T.
Posted on 06.11.18 Mel G.
If you want perfect quality weed for the right price then you need to go here and talk to Steve. Hes cool and has knowledge about bud he runs his business right. all his delivery drivers or awesome organic bless deserve a perfect rating. Steve your doing a great job. Nothing short of amazing, literally curing me each time I order! Most knowledgeable and compassionate man I've met in this Mmj business for real ill ppl!!! Posted on 05.31.15 Vonda S.
steve is awesome, we have been buying from him for several months now, not only is he a cool guy but his meds are amazing and the prices are great, he hooks it up, we will not buy from anyone else.